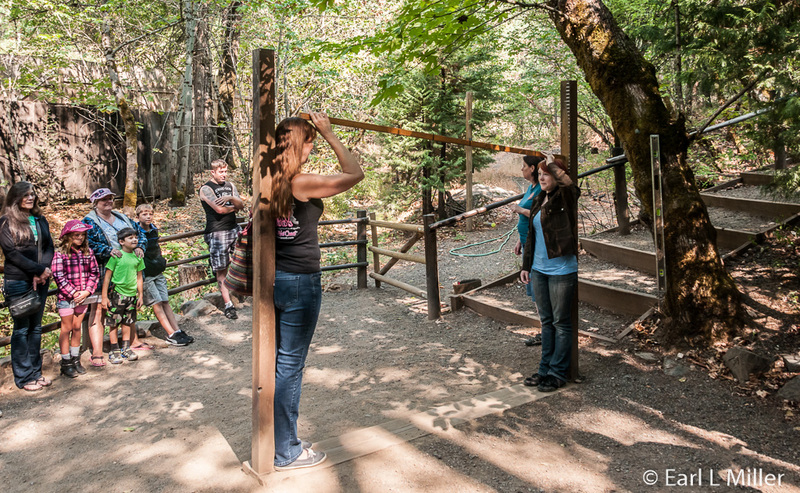 Besides the Dogs for the Deaf and Harry and David tours, Southwest Oregon has attractions to keep visitors busy for weeks. 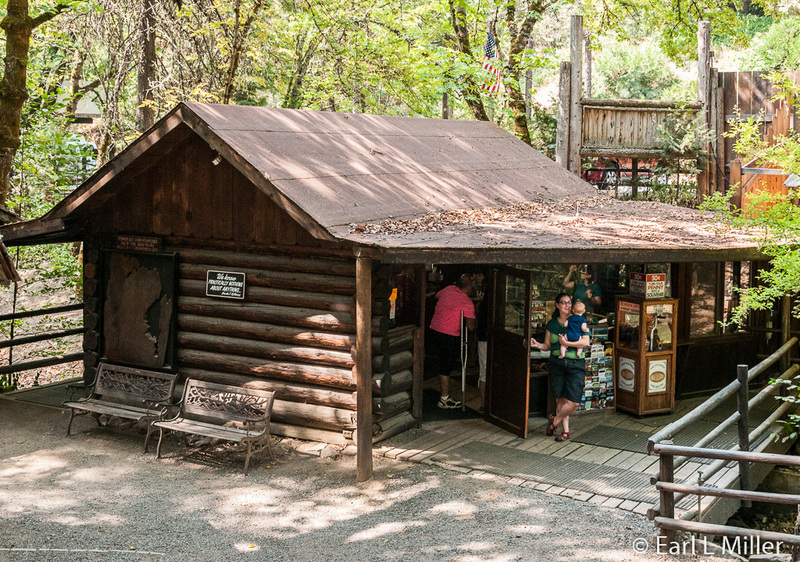 In the first of two articles, I’ll cover Eagle Creek’s Butte Creek Mill, Medford’s Roundtable Tea Company, and Gold Hill’s Oregon Vortex. Northwest of Medford, you’ll find a site that has been raising curiosity since it opened in the 1930's. The area claims a spherical area of force (or vortex) covering about half an acre area. The vortex supposedly has a magical effect. It can make people grow or shrink when changing places on a level platform, cause golf balls and bottles to defy gravity and run uphill, force compasses to go haywire, and permit a broom to stand on its own. Another interesting effect is that people inside the vortex naturally stand with a slight incline although they believe they are standing upright. This causes some people to feel as if they are having an attack of dizziness while standing inside the sphere of force. 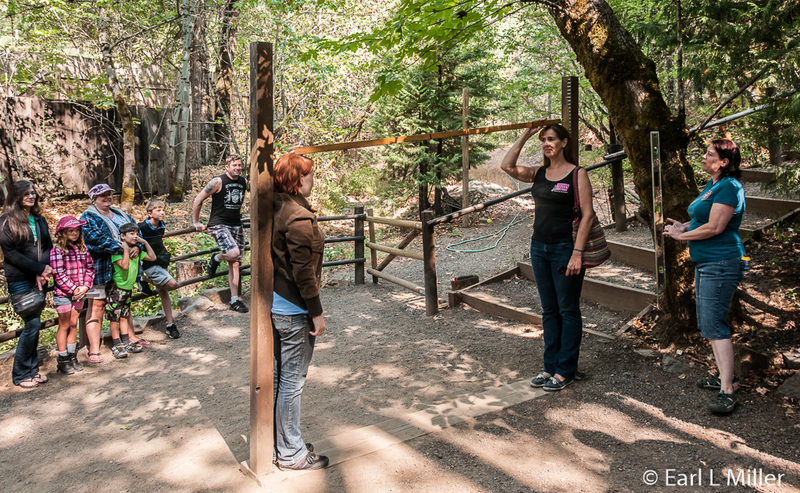 Our guide at Oregon Vortex illustrated all of these effects on an hour tour. Whether it is due to some scientific factor or to carefully performed illusions has been a source of question. Some scientists and skeptics have disputed it. Yet, a curious history of the area makes you wonder. Native Americans considered this area as the “Forbidden Ground.” Neither they nor their horses would go near it. Our guide told us most animals won’t go anywhere near it. The Old Grey Eagle Mining Company erected a building on the site in 1904 which served as an assay office and later for storage. It’s reported miners had their gold weighed but were confused by the scale’s readings which were wildly off. In 1914-15 the house slid off its foundations coming to rest at an odd angle. It’s now called “The House of Mystery.” Although our guide claimed the house has nothing to do with the vortex, many demonstrations we saw took place inside the house and in its backyard. In 1920, a scientist and mining engineer, John Lister, came to the area. He opened the site in 1930 and lived there until his death in 1959, probing its mysteries and writing a book Notes and Data Relative to the Phenomena in the House of Mystery. Legend has it that Lister did not feel the world was ready for his findings so he supposedly burned them before his death. However, a pamphlet of his notes is available for sale at the Oregon Vortex’s gift shop. Sometimes light anomalies (large white orbs) have been noted in photographs taken at the site in the 1960's. We saw these when we returned to the gift shop. It has some wondering if these are orbits of Lister’s ghost? Visitors have noticed an elderly man, in the House of Mystery, in older clothing, just standing and smiling at the passing groups. Or is this a whirlpool of force wrapped around the home’s poles? Ernest and Irene Cooper purchased the site from Mrs. Lister in 1960. It was passed through the family to their children. Their daughter, Maria, ran it for around 30 years and is now passing the torch to her son Mark and daughter-in-law, Elena. I met Elena when we visited last August. I asked her what was causing the effects. The answer is the Coopers have no idea. Two theories are the bending and refracting or light or, perhaps, a density shift where mass inside the area expands and contracts. 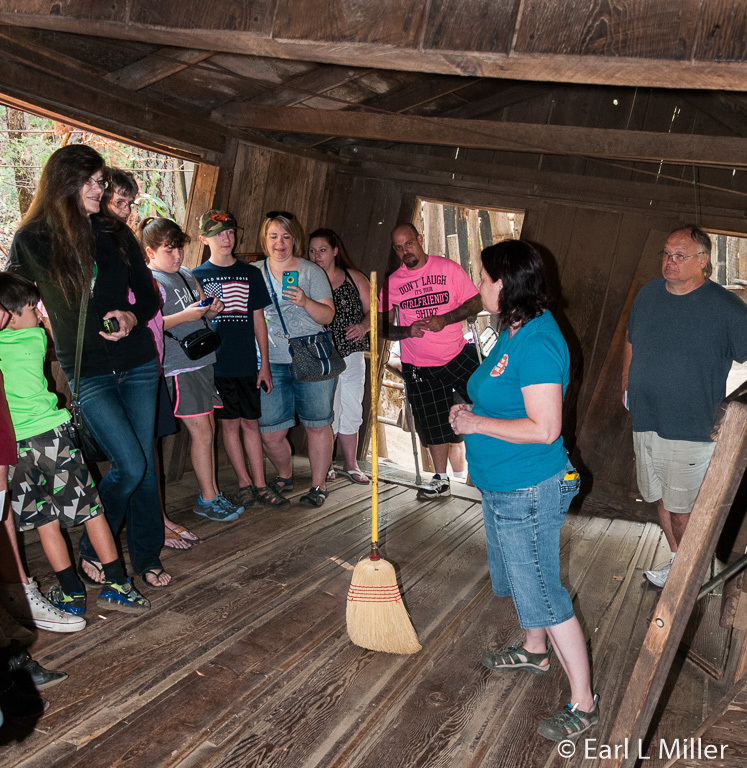 After listening to the guide and seeing the demonstrations, we could not determine whether the Oregon Vortex has true mystery behind it or if it is a series of well-performed illusions. It is up to each visitor to decide for himself. The tour lasts anywhere from 45-60 minutes with people waiting between 15 and 20 minutes for it to start. The season is March to October. From March through May, September, and October, hours are 9:00 a.m. to 4:00 p.m. During June through August, hours are 8:00 a.m. to 5:00 p.m. Admission is $12.50 for adults, $11.50 for ages 62 and older, $9 for ages 6-11, and free for ages five and younger. 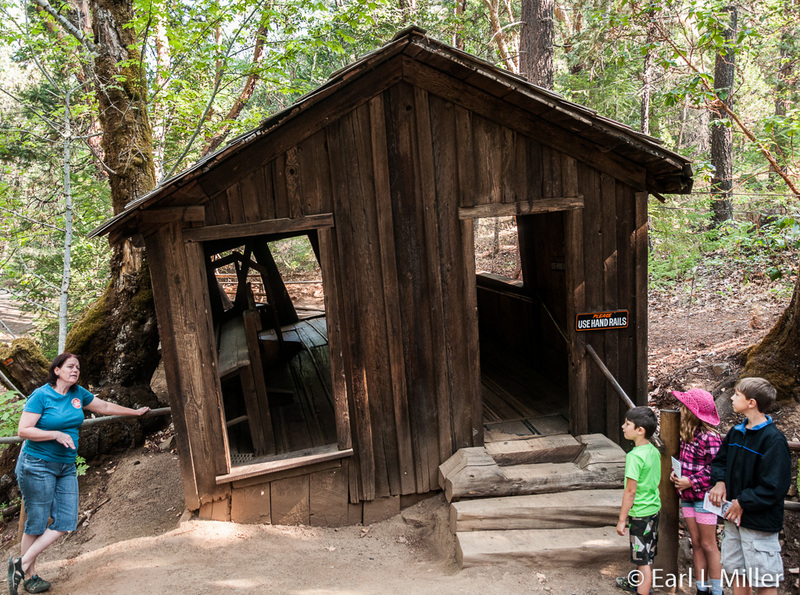 The Oregon Vortex is located at 4303 Sardine Creek Left Fork Road at Gold Hill. The phone number is (541) 855-1543. 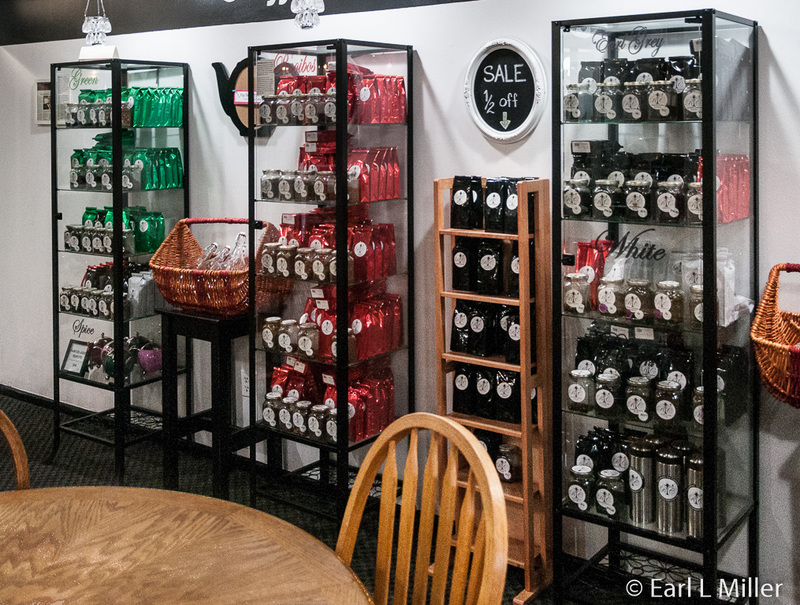 Tea lovers will enjoy spending a late morning or afternoon at Medford’s Roundtable Tea Company. It’s a store owned by John and Sandra Wiuff where you can taste and buy 120 different teas and have “High” tea as well. Their company was a result of a lifelong dream that Sandra and her sister, Bev, shared. They enjoyed the experience of having their family gathered around a table with a good cup of tea, enjoying delicious baked goods. They wanted to share that experience with others. When Bev passed away in 2011, they decided to honor her. Since John and Sandra loved tea, it was a natural to create the Roundtable Tea Company. They started by selling loose leaf tea on line then came the sampling. 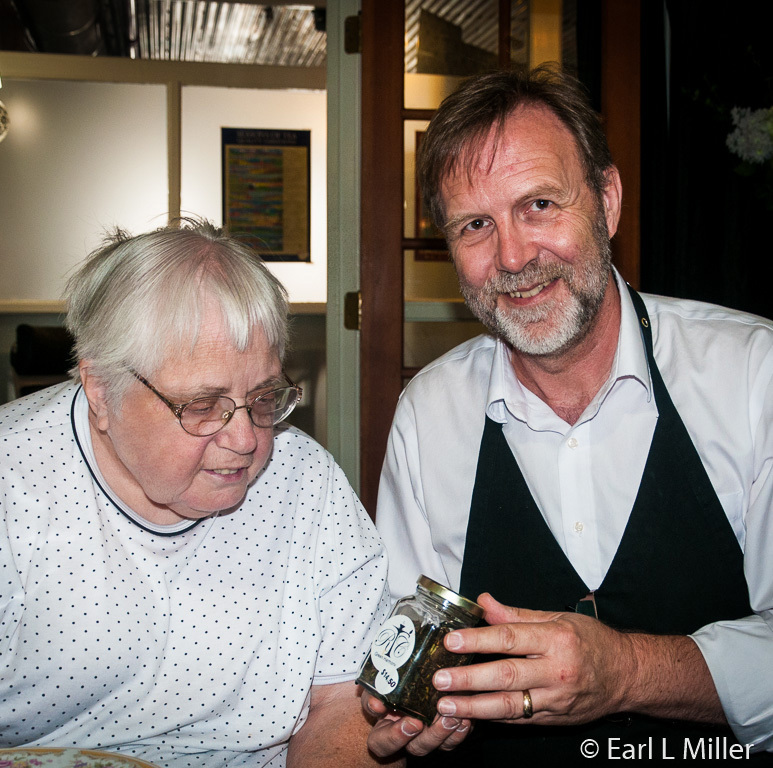 Before serving us tea, John started by telling us about the history of “High” tea. Anna, Duchess of Bedford, in the mid 1800's, started the practice of drinking tea and eating small cakes in the late afternoon. Since she couldn’t bear waiting from breakfast to dinner at 8:00 p.m., she began nibbling snacks with her friends around 4:00 p.m.
We also learned there are different types of teas. The afternoon or low tea consists of elegant sandwiches, scones, cakes, and cookies. Originating with the upper classes, it is served in the late afternoon, usually in a sitting room around a low table in comfortable chairs. So what most people consider “High” tea is actually an afternoon tea. A popular type of afternoon tea is the Cream Tea. It’s a light snack of scones served with clotted Devonshire cream and jam instead of butter. High tea is served close to 6:00 p.m. and is really a small supper or the working man’s tea. It is served at the dining table and consists of a substantial meal. It can include cold cuts, shepherds pie, baked beans on toast, steak and kidney pie, cakes, custards, sweets, and pickles. It always includes tea. John also told us about the types of tea. All come from the same plant, the Carnellia Sinensis plant. The differences arise from processing, growing conditions, and geography. Black tea is a fermented leaf preferred by the West. The leaves are given some moisture and placed in a warm environment that will encourage them to ferment until they turn completely black. Green tea withers only slightly after being picked. Its oxidation process is stopped very quickly by rapidly heating the leaves. When it’s brewed at lower temperatures for less time, it contains less caffeine. It is picked in the spring and other times during the year. White teas are the most delicate of all. These are hand processed using the tea plant’s youngest shoots with no oxidation. They should be brewed at a very low temperature and have a short steeping time to produce low amounts of caffeine. But by themselves, white tea does not have less caffeine than other teas. White tea is picked in the spring. John depends on two blenders. One is Devon Shaw, from San Francisco, who wrote a best-selling book on tea in North America with James Norwood Pratt. Shaw was a native of India who managed a tea estate. His other blender is located in Toronto and blends for the best tea rooms like the Empress in Victoria, B.C., Canada. Roundtable Tea Company always serves three teas to small groups: a green or white, a black, and a decaffeinated tea. Each has its own silver service. Food is served on fine china, with white tablecloths covering each table. Classical music gently plays in the background. We were served Green Harmony, a blend of a spring green tea and summer roasted green tea with just a bit of mesquite taste. Our next tea was Rooibos Mocha Rocha. It contained butterscotch and hazelnut pieces, decaffeinated coffee, and Calendula petals. Our final tea was St. Andrews Exotic Black Tea. It was flavored with chrysanthemum petals and marigolds with raspberry and lemon flavors. These were accompanied by rosemary chicken sandwiches containing smoked almonds and green onions. We also had cucumber and minted cream cheese sandwiches. The Scottish scones consisted of cranberry orange and apricot ginger with sides of lemon curd, cream cheese, and heavy whipping cream. For desert, we munched on oreo cheesecake bites and hand-dipped strawberries. What is served depends on three factors: what’s in season, what’s available, and what the chef feels like making. It is necessary to call Roundtable a day before as the company requires reservations. With only a party of two, you will receive chef’s choice. When they serve groups larger than six people, they serve more options. 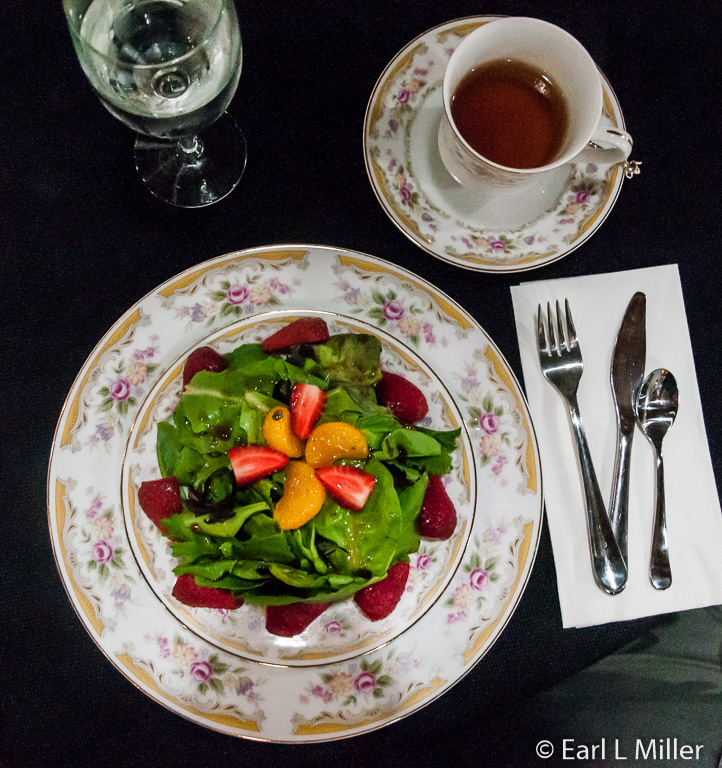 The high tea we had was delicious and something we would do again when we visit Medford. Roundtable Tea Company is located at 406 E. Main Street, Suite F, in Medford. Their telephone number is (541) 778-0866. 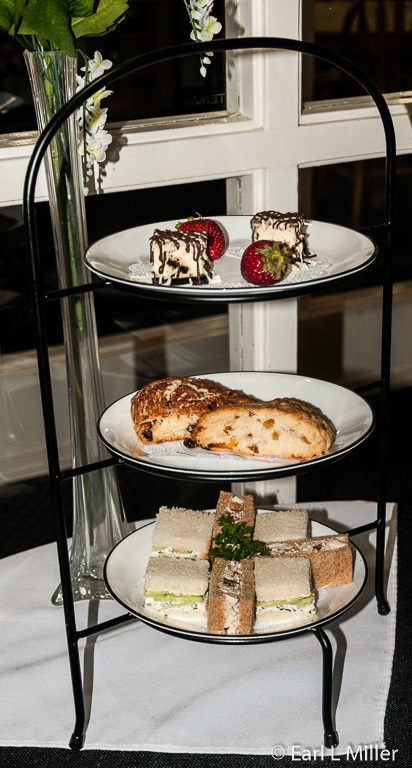 High tea is served from Tuesday to Friday from 9:00 a.m. to 5:00 p.m. and Saturday by appointment. Cost is $20 per person. Their web site for purchasing tea is www.Roundtabletea.com. We were fortunate to visit this historic mill in July as it burned down this past Christmas day. 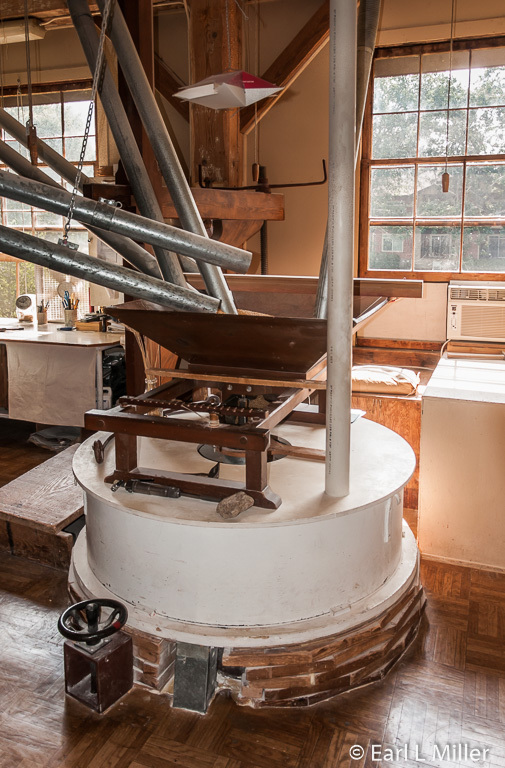 It was one of two remaining water-powered mills in Oregon and the only mill still grinding flour. It was also the last water-powered grist mill still commercially operating on the western side of the Mississippi River. It was placed on the National Register of Historic Places on September 1, 1976. It was a wonderful mill, the treasure of Eagle Creek, near Medford. You could sit outside at the tables and chairs while hearing the clacking and humming of pulleys and belts working the mill’s machinery. Visitors, who came from long distances, loved its mixes. Besides Dogs for the Deaf and Harry & David, it was regarded as the third leg of a triad of area tours not to be missed. It was the home of concerts and events, wine tastings, and many weddings and receptions. The old mill was a four-story structure. That included the main floor, which was the grinding floor. The two upper floors were used for storage for the cleaned grain as well as for tools and other equipment. The basement was where the water power was harnessed. It was the home for the turbines. Its architecture was quite interesting. Its structural frame was composed of square hand hewn posts and beams. The beams were morticed together and pinned with hard wooden pegs. Walls of whipsawed lumber were nailed to the frame with square nails. Foundation pillars had been hewn with a broad ax. In 1912 and 1930, additions were made compatible with the original building using similar types of materials and detailing. French buhr stones, quarried in France in 1872, were assembled into four-foot diameter stones in Moline, Illinois. 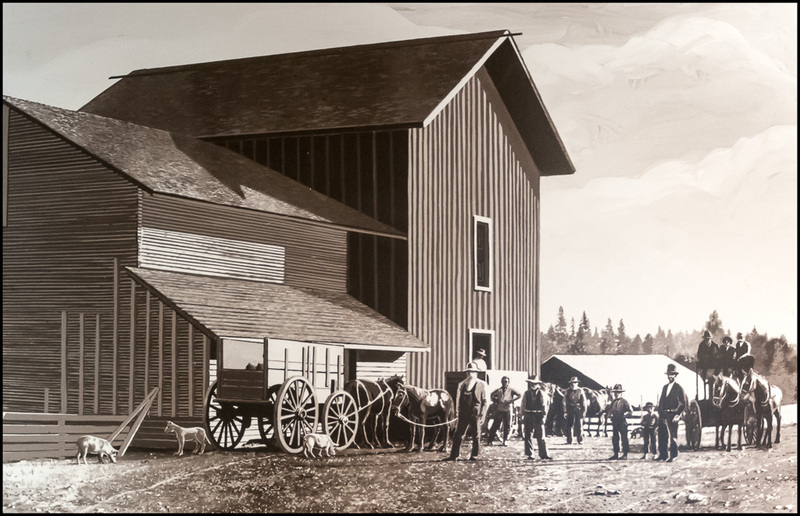 The stones were carried by wagon over the mountain to Snowy Butte Creek Mill, the mill’s original name. The first flour was ground in August 1873. Farmers, traveling long distances, would bring their wheat to the mill, often lining Military Road for miles to have their flour ground. 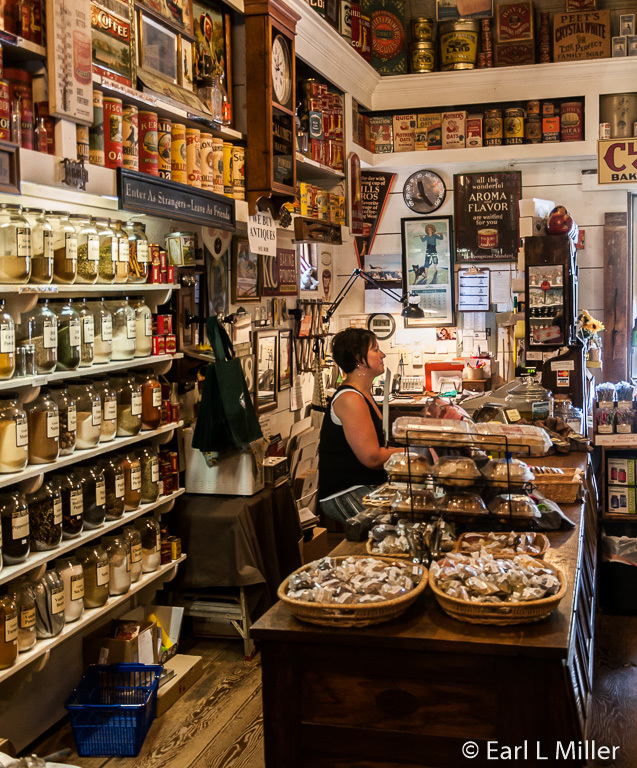 For payment of his services, the miller kept every seventh bag of flour to sell in the mill’s general store. In the late 1880s, roller machinery replaced the stones. 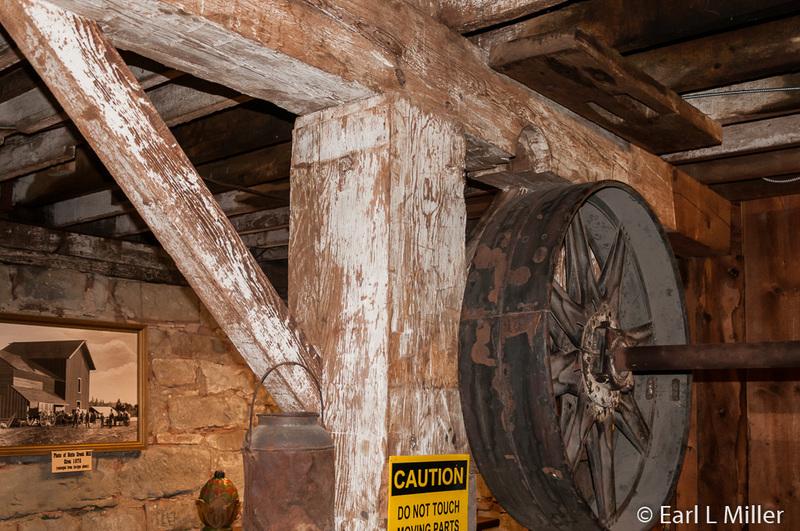 While in 1932, the mill’s owner found and repaired the old grinding stones and put them back into operation. These stones were still being used when the mill burned. It was not a water-wheel operated mill. Instead the water from the millrace flowed into a twelve-foot deep penstock. 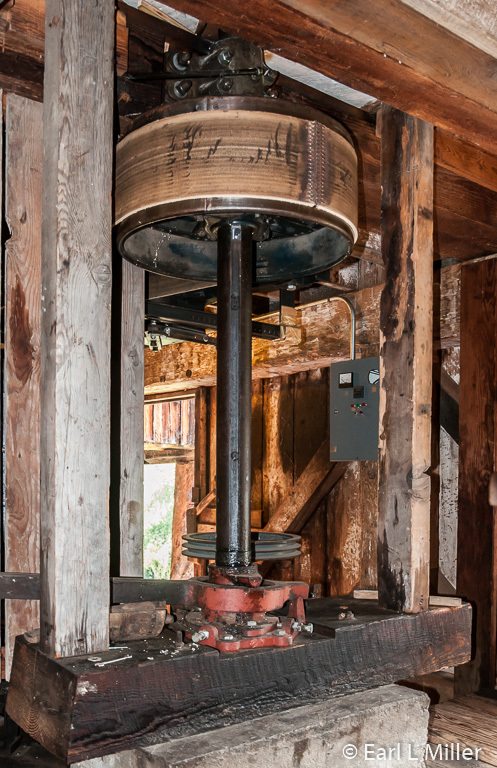 The weight provided pressure to activate the turbine which ran the wheels, belts, and pulleys. 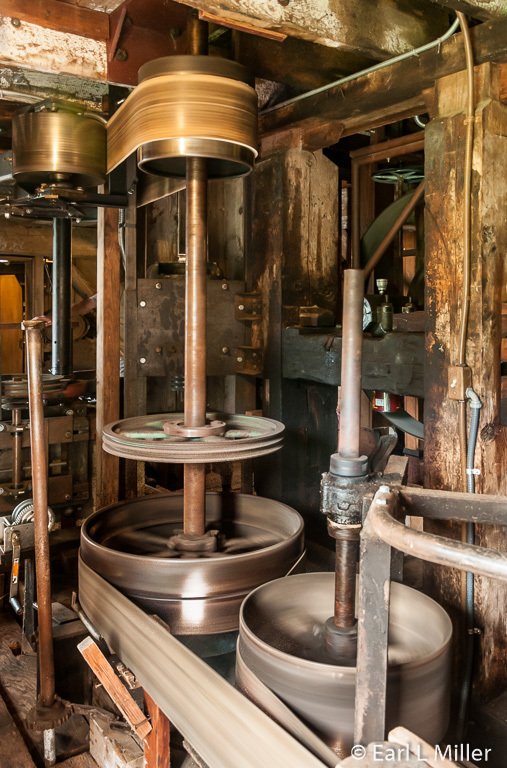 This movement also turned the large millstones grinding the grain. Grain was brought down via chutes from the second floor, after it was scalped and scoured, It was then fed into a hopper that fed the “eye” of the stones. In about three hours, it was ground into flour or cracked wheat depending on the stones’ setting. Next to the milling area, you could visit its Country Store. 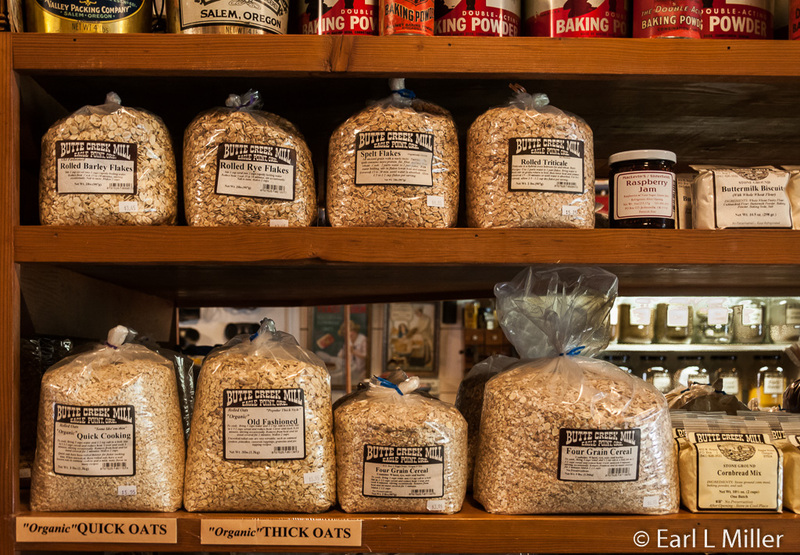 Known for its pancake and waffle mix, bran muffin mix, and cornbread mix, it sold all sorts of Oregon items. It also stocked cold drinks, kitchen and baking items, bulk spices, loose teas, and ice cream. Adjacent to the mill had been a 1895 cheese factory. It had been converted to an antique store. Before the building burned, on the first floor, you could watch the miller working. That was also the place to enjoy old pictures and mill memorabilia. The basement allowed people to see and understand the water wheel grinding process, view more antiques, and see the turbines. It also contained a large photograph of the mill circa 1875. The mill had a variety of owners between 1872 and 2005. In 2005, Bob Russell, purchased the mill. Bob's goal now is to hopefully rebuild the structure. He believes the millstones are intact and that the basement may be able to be saved. He has started recovering the antiques and mill’s important pieces. If thirty percent of the original Mill, including the foundation, can be saved, it may be able to stay on the National Register of Historic Places. The mill was located at 402 N. Royal Avenue in Eagle Point. You can read about the progress of restoring it at www.buttecreekmill.com. 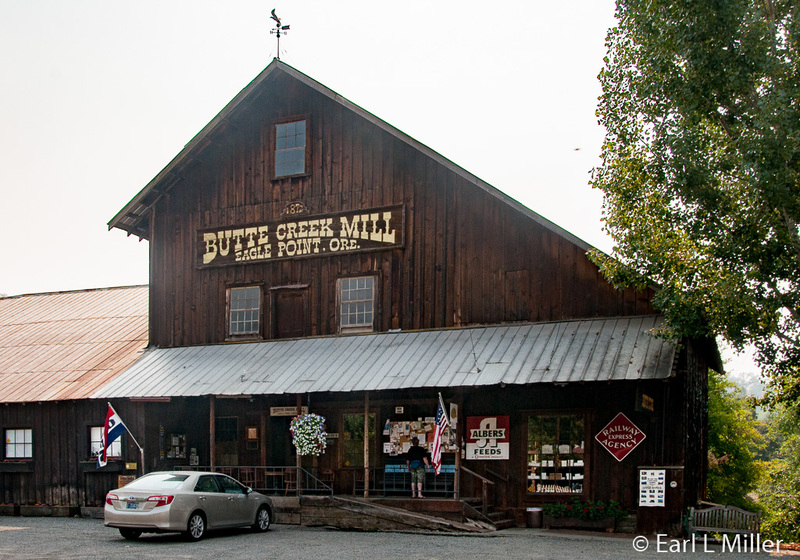 It will be a slow and arduous process, but hopefully with strong support, Butte Creek Mill will be once more.